Montenegro is located in Southern Europe, in the central Mediterranean. To the north it borders Serbia, to the southeast Kosovo and Albania, to the south it is separated from Italy by the Adriatic Sea and to the west it borders Croatia and Bosnia and Herzegovina. The capital of the country is Podgorica. Cultures that exist in today’s Montenegro contain traces and influences of Mediterranean, Central European, Eastern European and Oriental civilizations from various times. The Illyrians, Hellenes, Romans, Slavs, Turks - they all tended to leave traces of their homeland on these new shores incorporating pieces of their own traditions in Montenegro’s wildness – in stone, language, image, sound, respect for God. Archaeological sites and museums keep their traces. The remains of old Roman temples have been standing here for two thousand years as well as aqueducts, cities, bridges (Risan, Budva, Akruvium, Ulcinj, Doclea, Municipium S). Perhaps this eternal interweaving of cultures and artistic influences is the thing that is most beautiful in Montenegro, what has resulted from continuous movement and touching of tribes and nations. Interweaving of East and West, paganism and Christianity, Orthodoxy and Catholicism, Christianity and Islam, Byzantine and Romanesque postulates, traditions and modern times, they have all influenced on the development of art and culture in the region. The fabulously jagged coastline of the Adriatic sea offers you the variety of beaches, coves, bays and islets that you have been dreaming of. The reality is even more exotic then the promises found in tourist brochures. The world’s southernmost and probably the most celebrated fjord in verse, beautiful Mediterranean Kotor Bay, as well as the whole seacoast, is sheltered and shielded by the karstic mountains: Rumija, Sutomoran, Orjen, and Lovcen. In these picturesque karstic areas and in the cultivated Zeta and Bjelopavlici valleys, you will get the essence of Montenegrin mountains. The high mountains like Durmitor, Bjelasica, Komovi, and Visitor can offer you an unforgettable experience with their hidden lakes, numerous pastures, forests, pointed peaks, diverse flora and fauna, fast mountain rivers and imposing canyons. It is hard to resist the charm of medieval towns and fortresses on Montenegrin coast: Budva, Kotor, Risan, Perast, Herceg Novi, Bar, Ulcinj. This is where Byzantine school and Romanesque, Gothic, Baroque waves in architecture, stone sculptures and paintings are touching and interweaving. 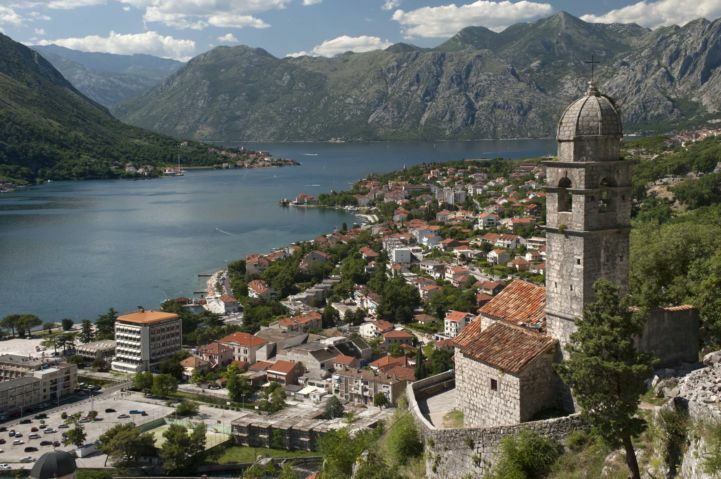 The city of Kotor is, as part of the world cultural heritage, under UNESCO’s protection. There are three colors present in the Montenegrin landscape: blue, emerald green and iron gray, amazingly combined and interwoven, because of its priceless natural beauty, Montenegro was proclaimed an ecological state through a special declaration. Generous and miserly, cruel and graceful, fascinating nature of this country has always aroused excitement and inspiration. White and gray waste land of limestone area rises above the coastline. “Sea of rocks” is only one segment of the sumptuous mosaic. In the central region there are the fertile Zetska and Bjelopavlićka plains and a bird paradise - Skadar Lake. Then there is a wreath of mountain ranges over 2,000 meters high. Apart from the peaks, they are adorned by woods, spacious pastures, forty lakes, impetuous and clean rivers, deep and mysterious canyons. The worlds of beauty are under water and underground - in many caves whose exploration has only begun. Montenegro has five national parks. Durmitor with the Tara River Canyon is part of the world natural heritage. The Tara River Canyon is on the list of international biosphere reserves. As a rare wetland habitat Skadar Lake is included on the Ramsar List. A state with a long tradition, the meeting point of different cultural and religious influences on the border of Orthodox East and Catholic West, today’s Montenegro is a multi-confessional and multi-ethnic environment functioning in perfect harmony. Traces of human presence date from the distant Paleolithic times, evidence of which has been found at the archaeological site Crvena Stijena (Red Rock). The first known ethnic groups, numerous Illyrian tribes originated from the 5th-2nd centuries B.C. After this period, the region became part of the newly formed province of Prevalis, under the patronage of Imperial Rome. Evidence of this period are found in the numerous settlements of an urban type, formed around previous Illyrian settlements – Doclea, Municipium S, Medun, Budva, Ulcinj, Risan, etc. After the collapse of the great Roman Empire, this region was conquered by Byzantine rulers, which in the middle of the 6th century were faced with the emergence of the Slavs. After several centuries of ethnic assimilation of numerous Christianised Slavs with the native and Roman population, the origins of the first state organisation were started at the beginning of the 9th century – historically known as Doclea, headed by Prince Petar. Doclea, known as Zeta from the 11th century, as a principality and kingdom, with the respectable Vojislavljević dynasty and its own church structure – the famous archdiocese of Bar, existed until the end of the 12th century, when its territory was conquered by the Serbian Nemanjić dynasty. After World War I and the fall of the Petrović-Njegoš dynasty, Montenegro became part of the newly formed South Slavic states – the Kingdom of Serbs, Croats and Slovenes, and subsequently the Kingdom of Yugoslavia. After restoring part of its state sovereignty, following World War II, Montenegro had the status of republic, and was a federal member of the Federal People’s Republic of Yugoslavia, Socialist Federal Republic of Yugoslavia, Federal Republic of Yugoslavia and State Union of Serbia and Montenegro. By the majority decision of its citizens, Montenegro restored its independence on May 21, 2006, becoming an internationally recognised state.